St. Louis Big Band to perform on Jan 28 at Simmons Center. The Chisholm Trail Arts Council is proud to present the St. Louis Big Band. The St. Louis Big Band, which features an 18-piece orchestra and Frank Sinatra style vocalist Joe Scalzitti, is celebrating its 6th season of performing world-class Big Band music from the 1930’s and 1940’s. The band was founded in 2010 in St. Louis, Missouri to bring swing and hot-jazz music into our modern era. 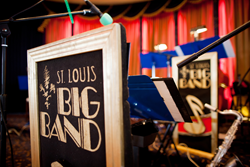 Since the formation of the group, St. Louis Big Band has graced the stage with more than 250 live performances in several different states. Performing Sinatra’s famous hits such as “My Way” and “New York New York” as well as performances from Orchestras such as The Count Basie Orchestra, The Glenn Miller Orchestra, The Duke Ellington Orchestra, The Benny Goodman Orchestra, The Tommy Dorsey Orchestra and the list goes on and on. Join CTAC on January 28, 2017 for a night of dancing and light refreshments and a cash bar sponsored by Murphree’s Wine and Spirits. Special thank you to Duncan Area Development Foundation and First Bank & Trust for your continued sponsorship of CTAC Live Concert Series. Seating is limited. For more information please visit us at http://www.chisholmtrailarts.com or call 580-252-4160.